Why fork over your hard-earned cash on some newfangled wearable exercise gadget when you’ve already got a smartphone stowed in your pocket? That compact computer hosts a multitude of sensors, and with the right selection of apps and a little discipline, it can be as powerful a workout companion as a dedicated trainer. Whether you’re looking to track your miles, find a little motivation, eat healthier, or simply make exercise slightly more entertaining, there is likely an app for that. We took the time to dig through the Google Play Store and bring you an in-depth roundup of the best fitness apps for Android. Now, you just have to stick to the routine. Simply looking to keep track of your runs and day-to-day activities, with a little feedback in the form of charts and graphs? Check out the selection of apps below. Runkeeper employs your phone’s GPS transceiver to log your running pace and distance on various routes in real-time. You can also set a goal pace, and the app will feed you audio updates to stay on track with the tempo. You can set up a personalized routine, join a running group, share your progress, take on challenges with rewards, and a whole lot more. Why not pair Runkeeper with some of our favorite earbuds for running? Runtastic tracks all kinds of metrics from your running, such as your distance and relative pace, as well as calories burned and your heart rate. You’ll also find motivational audio feedback, running groups, competitive leaderboards, and lots of integration with wearables. If you have a Wear OS smartwatch, you can leave your phone at home and still be tracked. Spring for a premium membership and you can get rid of the ads and unlock even more features. Strava is an excellent tracking app that monitors your runs or cycling routes via GPS. It gamifies your cardio workout and offers leaderboards, achievements, and challenges, bringing a competitive spirit to your routine. There’s a network of athletes using the app, so you can find the most popular running routes in new cities, or share progress with friends. It also offers Wear OS support. Providing a detailed workout summary charting your distance and pace is Map My Run’s bread and butter. The app also offers customizable audio feedback on your runs, challenges to motivate you through competition, suggests routes to run, and tracks more than 600 other activities. There’s an active community onboard and lots of extras, not to mention an ad-free premium version which offers deeper analysis of your training. Argus is a neat, completely free, all-in-one activity tracker that monitors your sleep, heart rate, calories, and more. The app offers challenges to overcome, as well as the option to build your own workout plan. You can even add food you eat by scanning the barcode on the label to track your calories. Another app that uses your device’s built-in pedometer to track your walks, Pedometer comes with a host of extra features. It has an easy-to-read “Trends” section that shows your activity history, and you can connect with exercise groups in your area, or take up challenges. Pedometer can sync with MyFitnessPal to keep your records automatically updated. While it’s not a full-fledged workout guide like some of the ones below, it does allow you to create a daily exercise plan and share your progress with a supportive community. Google’s fitness app is very simple and it focuses on getting you to move and work your heart, challenging you to hit a target each day for Move Minutes and Heart Points. You can also use it to track workouts, get customized tips, and pull in data from Wear OS smartwatches, not to mention a host of other apps and devices. 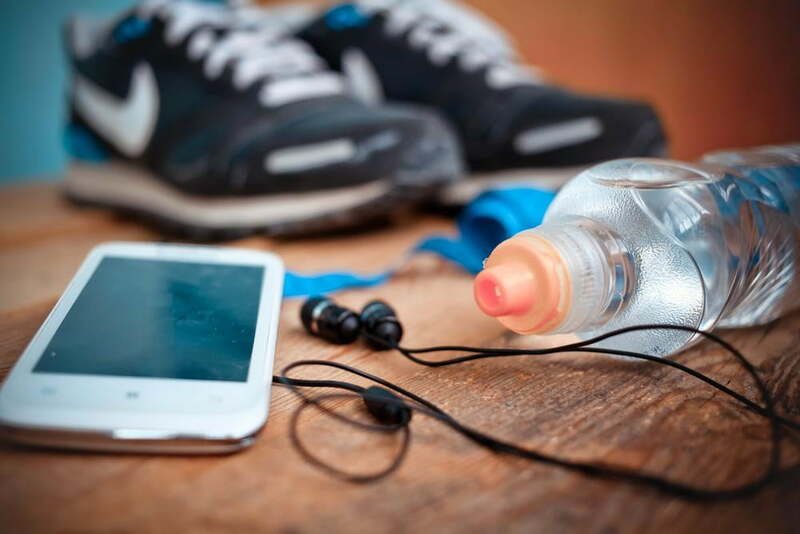 Coaches and personal trainers are great, but if you can’t afford to have Jillian Michaels come scream at you every time you hop on the treadmill, we suggest using these low-cost apps to help guide you through your workout. Nike Training Club offers hundreds of 15- to 45-minute workouts. The app provides detailed suggestions based on your own personal fitness goals. It excels when it comes to explanatory photos and video demonstrations that show you how to properly execute each exercise — all of which are stored directly within the app for added convenience when offline. Strong Lifts 5×5 is designed for experienced lifters who want nothing more than to gain muscle and lose fat. It’s likely too intense for inexperienced lifters, but the app can still coach you through three 45-minute workouts a week, focusing on the largest muscles in your body for optimal effect. Calendars and simple plate calculators take the app’s functionality even further. Workout Trainer is packed with hundreds of workout routines, training recommendations, and custom programs that suit your abilities. It can also sync up with your smartwatch or heart rate monitor to provide deeper analysis. You can also connect with personal trainers through the app and share your activity with the community. The Pro membership opens up more options for $7 per month or $60 per year. Sworkit provides gym-quality routines without actually requiring you to go to the gym. The app allows you to choose from hundreds of workouts, each of which is divided into one of four distinct categories (strength, cardio, yoga, and stretching). Hell, it even lets you create short, five-minute workouts when you’re in a pinch. You can also create custom workouts and even talk to personal trainers for help. This app used to be free, but you have to sign up for a subscription now at $30 per quarter or $80 for the year, though you can try it out for 30 days for free. Initially designed for bodybuilders, Jefit keeps track of all your reps, sets, and the weight you’re lifting within a sleek interface. The app also provides a number of different workout routines designed to target specific muscle groups, while allowing you to curate custom workouts and share your achievements with the online community. The mere 1,300 training exercises are only the beginning. This app has been developed by the British Army to help prospective recruits achieve the level of fitness needed to enroll, but it can be used by anyone who wants to improve their overall physical health. Each exercise is explained by an experienced instructor, who continues to encourage you throughout the session. Successful completion of exercises rewards you with medals that can be shared on social media that count up to your goal of becoming “100 percent army fit”.